Since publication of his first book, Life On Wheels, Gary has been devoted to bringing the world up to speed on the truth of the disability experience, so everyone gets a shot at their highest potential. After graduating with degrees in architecture in 1980, Gary worked as a graphic artist and manager as a pioneering computer graphics specialist in the 80s. At Chartmasters in San Francisco he founded their Desktop Services Group, one of the country's first. Injured again in 1992 from intensive computer work, Gary took a year off and then began Onsight, consulting around the San Francisco Bay Area in office ergonomics. In 1996 Gary signed a contract with O'Reilly & Associates who were launching a consumer-targeted line of medical books, "Patient-Centered Guides." In 1998, Choosing A Wheelchair: A Guide for Optimal Independence" was released, followed in 1999 by Life On Wheels: For the Active Wheelchair User, both widely reviewed as definitive guidebooks. The books pointed Gary on his path as a disability awareness communicator. 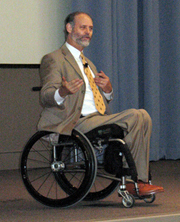 His activities have ranged from journalism, writing features and profiles for New Mobility magazine and various web sites including Disaboom.com. He has spoken widely at conferences, meetings, and universities across the U.S., as well as a tour of new Zealand and Australia in 2000. Since 2003, Gary has been sponsored by the Christopher & Dana Reeve Paralysis Resource center, a program of the Reeve Foundation, to speak at physical and occupational therapy programs and rehabilitation centers. Since the program's inceptions he has spoken at over 70 sites in 16 states. In 2004, partnered with Stanley Klein, Ph.D., From There To Here: Stories of Adjustment to Spinal Cord Injury was released, published by Leonard Media, owners of New Mobility. A collection of 45 essays, each goes intimately into the process of adjustment to trauma. Gary is committed to inspiration through information, rather than simply emotion. He works hard getting to the how of adjustment, making it real and deeply human. A fourth book, Disability & the Art of Kissing: Qs and As on the True Nature of Intimacy was self-published in 2007. Ever anxious to reach beyond the disability community to impact prevailing social beliefs about disability, Gary has set his sights on the workplace. With his background in business and communication, he has found a unique formula for discussing disability in new, fresh terms that are relevant to business goals. His mantra, " This is not about 'hiring the handicapped' anymore." Studying training and training development at San Francisco State University, Gary has extended his skills beyond his unique talents as a speaker to develop as a facilitator and interactive workshop leader. Now, in the modes of speaker and trainer, Gary helps organizations find and keep the best people, fostering a creative spirit of problem solving and adaptivity throughout the workplace. In 2007 at the Kennedy Center in Washington D.C. Gary was inducted into the Spinal Cord Injury Hall of Fame as a disability educator. Gary is also a musician and juggler. He lives in San Rafael, CA with his wife Paula and their two Labrador retrievers.